Schola Cantorum of Oxford is one of the longest established and most widely known chamber choirs in the UK. Founded by conductor László Heltay in 1960 as Collegium Musicum Oxoniense, Schola Cantorum has worked with many highly respected musicians, including former patrons Sir Michael Tippett and Yehudi Menuhin, as well as Leonard Bernstein, Gustav Leonhardt, John Nelson, Sir Colin Davis, Sir Mark Elder, and Sir Neville Marriner. Schola Cantorum comprises around thirty singers, most of whom are students at Oxford University. Studying a broad variety of subjects across the Humanities and Sciences, the choir’s members rehearse during term, and regularly perform in Oxford and elsewhere. The choir has developed a noteworthy international reputation, having given concerts in recent years in Argentina, China, France, Italy, Israel, Malta, Mexico and Spain. In September 2014 the choir visited the USA for the first time since 1989, touring through New York, New Jersey, Connecticut, Philadelphia, Kentucky, Tennessee and Georgia. Schola Cantorum has enjoyed a long history of recordings. In 2008, the choir recorded music by American composer Randall Thompson on the Hyperion label, and in January 2010 added a recording of works by the Finnish composer Einojuhani Rautavaara. The choir has frequently appeared on UK and international radio and television, and has featured in several of John Bridcut’s BBC films, including Delius: Composer, Lover, Enigma; The Passions of Vaughan Williams, in commemoration of the 50th anniversary of the composer’s death; Elgar: The man behind the mask; The Prince and the Composer, a documentary on Hubert Parry presented by HRH the Prince of Wales; and Britten's Endgame, a film to commemorate the centenary of the composer's birth, broadcast in November 2013. In 2015 Schola Cantorum released a new CD, Oculi Omnium. Recorded in the spectacular acoustic of Merton College Chapel, Oxford, the CD is a 'celebration of England's choral tradition' and features pieces by Howells, Stanford, and the choir's previous conductor James Burton. In addition to their regular series of concerts in Oxford, highlights have included performances at the Dorchester Festival and in Beaulieu Abbey; the opening concert of the Fifth Masevaux International Festival of the Organ, performing with Thierry Escaich, a performance of Bach’s St Matthew Passion as part of the St Denis Festival broadcast on France Télévisions in 2011, and Berlioz’ Roméo et Juliette broadcast on Radio 3 from the Royal Festival Hall in February 2012, and performed at La Theatre Champs-Elysées with Sir Mark Elder. In January 2013 the choir performed Haydn’s Creation at the Royal Festival Hall with the Orchestra of the Age of Enlightenment and Adam Fischer, and also gave a concert of Bach’s Magnificat, Vivaldi’s Gloria and Handel’s Zadok the Priest in St John’s Co-Cathedral, Valletta, Malta. For the choir's 55th anniversary concert in May 2015, the current choir was joined once more by the OAE, distinguished soloists including the choir's patron Roderick Williams, and 150 former members to perform Brahm's Song of Destiny and Mozart's C Minor Mass. in 2016 the choir went on their third tour to Mexico, featuring two performances with the Mexican Orquesta Sinfónica Nacional at the Palacio des Bellas Artes alongside four young Mexican soloists and further concerts in the Teatro del Bicentinario in Léon, Santo Domingo Church in Mexico City and the Teatro Angela Peralta in San Miguel. ​Steven Grahl took over from James Burton as Conductor of Schola Cantorum in July 2017. 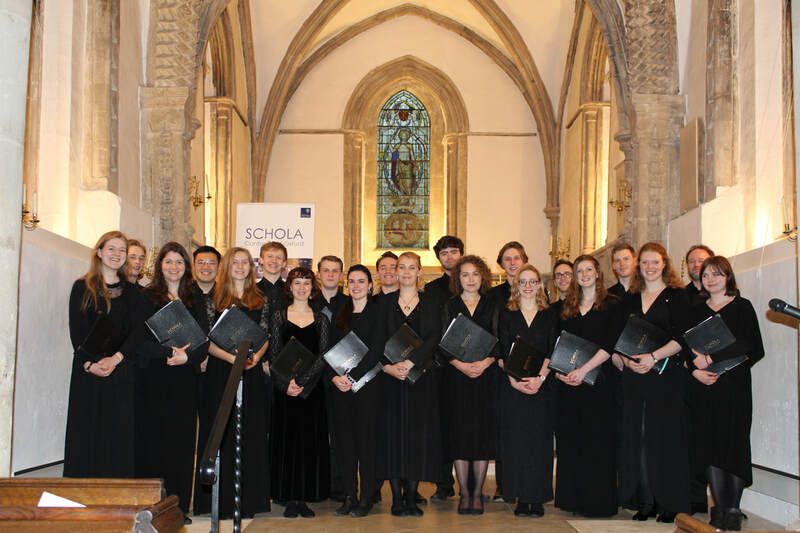 In addition to the usual termly concerts in Oxford and further afield, engagements for 2017-18 have included Brahms' Requiem at the Oxford Lieder Festival and Handel's Messiah in the Sheldonian Theatre with Oxford Philharmonic, In July 2018 Schola travelled to China, where they performed as one of the 'demonstration choirs' in the 14th China International Chorus Festival (CICF) in Beijing.
" Jamie Burton's encouragement and guidance help us to achieve the highest level of music making, and the experiences I have gained under his direction have been incredible."